Ureteroscopy / Uretheroscopy Surgery India offers information on Ureteroscopy / Uretheroscopy Surgery in India, Ureteroscopy / Uretheroscopy Surgery cost India, Ureteroscopy / Uretheroscopy Surgery hospital in India, Delhi, Mumbai, Chennai, Hyderabad & Bangalore, Ureteroscopy / Uretheroscopy Surgeon in India. A special telescope is passed through the urethra, bladder, and into the ureter to the stone or to view the area of interest. The telescope may be rigid or flexible. The procedure is usually performed under general anaesthesia. A stone breaker, grasper or laseris passed up the ureteroscope to perform the procedure. This is a minimally invasive procedure that makes use of natural channels in the body; there are no cuts to the skin. It is a well tolerated and frequently performed procedure. What are the reasons for having ureteroscopy? What are the advantages of ureteroscopy over other treatments? The stone is usually directly seen allowing the delivery of special instruments or lasers to break the stone. The ureteroscope is passed through natural channels in the body and involve no skin incisions. Providing the stone can be seen, there is a very high chance that the stone will be broken in one session. Flexible ureteroscopy allows entry into all parts of the kidney so that all stones can be removed or vaporised provided they are of an appropriate size and accessible. What are the risks of ureteroscopy? What are the alternatives to ureteroscopy? This is very good at removing stones in the kidney and upper ureter, but involves making a small incision in the back and passing a tube through the kidney. For the latter reason, it is more invasive than ureteroscopy. This is more successful than ureteroscopy, but involves making several incisions and needs a longer hospital stay. There is greater risk for infection as a result, although the absolute risk is still quite small. This is usually tried after all other therapies have failed. What do you have to do before ureteroscopy treatment? In most cases, admission to hospital will either be planned or as an emergency because of severe pain due to obstruction of the kidney. Ureteroscopy is performed under general anaesthetic, so no food or water should be consumed before the time of the operation. Usually, no food should have been eaten for at least 5 hours before surgery, but the exact duration will vary depending on the hospital. Less than 5 hours of no drinking is required. If ureteroscopy is being performed because of stones, an X-ray may be required before going to the operation. Urine is tested by nurses to determine whether a urine infection is likely. Antibiotics are administered at the time of the operation, but may be started a few days earlier if there is concern about bacterial infection. You should expect to be in hospital for at least the day, but sometimes an overnight stay is required. In some cases, a second or third procedure is required to complete the treatment so be aware that this is unlikely to be the only intervention. Under a general anaesthetic, a telescope examination of the bladder is performed ('cystoscopy'). A map of the urinary system is created by injecting contrast or dye in the urinary system. The telescope is passed up through the urethra ('water pipe'), bladder, ureter (the tube between the bladder and kidney), and up to the kidney if necessary. The next step depends on the location of the stone and whether an attempt to break the stone or push it into the kidney for later treatment by ESWL. If an attempt is made to break the stone, lasers or small hammers can vaporise or break a stone. At the end of the procedure, a special tube (JJ stent) is left in the ureter between the kidney and bladder. 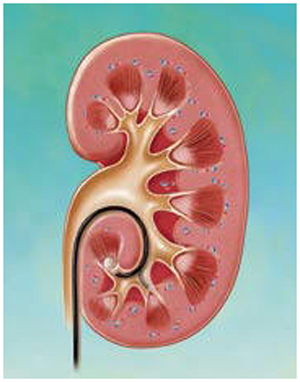 This is necessary because the ureter swells and can obstruct the flow of urine from the kidney to the bladder. More details are available by clicking JJ stent. Sometimes, a JJ stent is not used, but a specially designed thin tube that passes all the way up to the kidney and passes out through the urethra into a collecting bag. This is usually present for a day or so, and is removed easily by pulling it out. A catheter, which is a tube placed through the urethra into the bladder, may be used to drain the bladder, and this does not usually need to stay in more than 24 hours. What to expect after ureteroscopy? Such symptoms are usually transient, but if are bothersome may need review by a doctor especially if there is a fever present. More details are present on the JJ stent page. At some point after the procedure, either a plain X-ray or X-rays with contrast (IVU) may be requested. This is used to determine if the stone is still present or not. The JJ stent will need to be removed usually in outpatients with the aid of a flexible cystoscope under local anaesthetic. If the stone has been pushed up to the kidney, then ESWL is usually the next treatment to fragment the stone. How often does ureteroscopy need to be repeated? 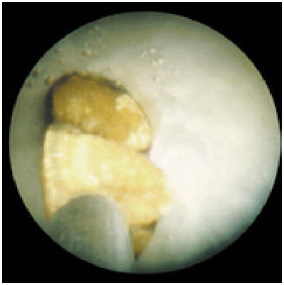 It may not be possible to reach the stone on the first attempt with the ureteroscope because of severe swelling that occurs when a stone is present in the ureter. In that situation, a JJ stent may be placed in the ureter. With a JJ stent in place, urine can drain from the kidney to the bladder and the ureter expands in size. As it becomes wider, it is easier to pass the ureteroscope up to the stone and remove. Sometimes, if the stone is very large, it may not be possible to remove the stone in one session and a second procedure may be necessary. On other occasions, small stone fragments or the whole stone may pass up into the kidney. If a flexible ureteroscope is available, this can be passed up into the kidney and the fragments removed or broken with a laser. What happens if ureteroscopy doesn't work? If rigid ureteroscopy cannot reach the stone, then a flexible ureteroscope may be able to get to the stone and the stone broken. At other times, the stone may have been pushed up into the kidney for further treatment by ESWL. Alternately, one of the other options listed above as alternatives may be necessary. What is the difference between rigid and flexible ureteroscopy? 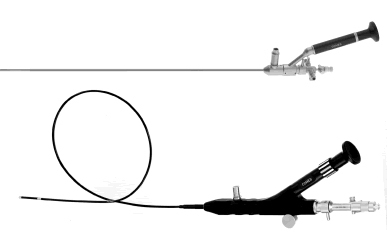 Rigid ureteroscopy is performed literally with a rigid telescope. As such, it look only in a straight line. Flexible ureteroscopy is performed with a very thin and flexible telescope that can perform almost a 180° turn and look back on itself. What reduces the risk of more stones in the future?